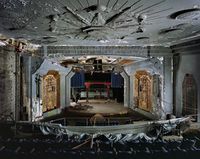 Interior of the Uptown Theater, the first project of the Uptown Entertainment and Development Corporation, in the process of renovation. A newly-acquired LPFM Radio Station: Uptown Radio, WJYN 98.5 FM. A Job Bank for construction workers. Uptown Youth Got Talent (UYGT) for job readiness, audio/video production and performing arts. Commercial Corridor Cleaning & Beautification. African American Preservation Heritage Trail / Historic Trail Project. UEDC also serves as a Registered Community Organization (RCO) for North Central Philadelphia (aka The Uptown Cultural District, Avenue of the Arts North, Harlem Quarter North) in conjunction with the City Planning Commission's Citizen Planning Institute. Note: The above descriptive information came from the organization's home page. A Life Of Community Service For Theaters In North Philly, Hidden City Philadelphia, February 6, 2019. 'Joy Ride' tells story of historic Uptown Theater, Philadelphia Tribune, May 23, 2013. This page was last edited on 12 February 2019, at 13:35.